The Washington Metro, commonly called Metro and branded Metrorail, is the Fairfax and Arlington counties and the independent city of Alexandria. The system is currently being expanded into Loudoun County, Virginia. The Metro service area is largely coextensive with the inner ring of the Washington metropolitan area. Opened in 1976, the network has grown to include six lines, 91 stations, and 117 miles (188 km) of route. Metro is the second-busiest rapid transit system in the United States in number of passenger trips, after the New York City Subway. 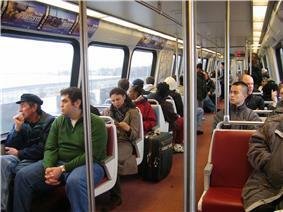 There were 215.3 million trips, or 727,684 trips per weekday, on Metro in fiscal year 2008. In June 2008, Metro set a monthly ridership record with 19,729,641 trips, or 798,456 per weekday. Fares vary based on the distance traveled, the time of day, and the type of card used by the passenger. Riders enter and exit the system using a stored-value card in the form of a paper magnetic stripe farecard or a proximity card called SmarTrip. During the 1960s, plans were laid for a massive freeway system in Washington. Harland Bartholomew, who chaired the National Capital Planning Commission, thought that a rail transit system would never be self-sufficient because of low density land uses and general transit ridership decline. But the plan met fierce opposition, and was altered to include a Capital Beltway system plus rail line radials. The Beltway received full funding; funding for the ambitious Inner Loop Freeway system was partially reallocated toward construction of the Metro system. In 1960, the federal government created the National Capital Transportation Agency to develop a rapid rail system. In 1966, a bill creating WMATA was passed by the federal government, the District of Columbia, Virginia, and Maryland, with planning power for the system being transferred to it from the NCTA. Rapid transit in Washington, D.C.
Archived versions:   of a track map on nycsubway.org that was removed post-9/11 at the request of WMATA. Wheaton and Forest Glen stations are shown with a single island platform when they actually have two separate inside platforms connected by a passageway. The flying junction at Rosslyn is shown with the incorrect track on top (although the platforms are shown correctly). It fails to show the tail tracks at Huntington station. ^ Luz Lazo, "Riders: Let there be light"; Express (Washington, D.C.), Dec 3, 2012, p. 12. The District of Columbia Department of Transportation is building the new DC Streetcar system to improve transit connectivity within the District. A tram line to connect Bolling Air Force Base to the Anacostia station and was originally expected to open in 2010. Streetcar routes have been proposed in the Atlas District, Capitol Hill, and the K Street corridor. While streetcars were originally expected to begin service in 2011, only the Atlas District route, known as the H/Benning Street route, is under construction and has experienced several delays and as of June 2015 has not opened. 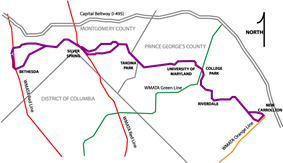 The Corridor Cities Transitway (CCT) is a proposed 15 miles (24 km) bus rapid transit line that would link Clarksburg, Maryland in northern Montgomery County with the Shady Grove station on the Red Line. Assuming that the anticipated federal, state, and local government funds are provided, construction of the first 9 miles (14 km) of the system would begin in 2018. In 2005, a Maryland lawmaker proposed a light rail system to connect areas of Southern Maryland, especially the rapidly growing area around the town of Waldorf, to the Branch Avenue station on the Green Line. The project is still in the planning stages. In 2011, Metro began studying the needs of the system through 2040. New Metro rail lines and extensions under consideration as part of this long term plan include: a new line which parallels the Capital Beltway; a new line from the Friendship Heights Metro station to White Oak, Maryland, which would pass through the District and Silver Spring; an extension of the Green Line to National Harbor in Maryland; and re-routing the Blue Line in the District between the Orange Line and Green Line. None of these lines are yet funded for planning or construction. In 2008, officials began to explore the possibility of adding an infill station called Potomac Yard in the Potomac Yard area of Alexandria, on the Blue and Yellow Lines between the National Airport and Braddock Road stations. In 2010, the Alexandria City Council approved a portion of the proposed $240 million construction of the station. If the council approves the final budget, construction would start in 2017 and the station would be scheduled to open in late 2018 or early 2019. In 2005, the Defense Department announced that it would be shifting 18,000 jobs to Fort Belvoir in Virginia and at least 5,000 jobs to Fort Meade in Maryland by 2012, as part of that year's Base Realignment and Closure plan. In anticipation of such a move, local officials and the military proposed extending the Blue and Green Lines to service each base. The proposed extension of the Green Line could cost $100 million per mile ($60 million per kilometer), and a light rail extension to Fort Belvoir was estimated to cost up to $800 million. Neither proposal has established timelines for planning or construction. The Virginia Department of Transportation (VDOT) announced on Jan 18, 2008 that it and the Virginia Department of Rail and Public Transportation (VDPRT) had begun work on a draft environmental impact statement (EIS) for the I-66 corridor in Fairfax and Prince William counties. According to VDOT the EIS, officially named the I-66 Multimodal Transportation and Environment Study, would focus on improving mobility along I-66 from the Capital Beltway (I-495) interchange in Fairfax County to the interchange with U.S. Route 15 in Prince William County. The EIS also allegedly includes a four station extension of the Orange Line past Vienna. The extension would continue to run in the I-66 median and would have stations at Chain Bridge Road, Fair Oaks, Stringfellow Road and Centreville near Virginia Route 28 and U.S. Route 29. In its final report published June 8, 2012, the study and analysis revealed that an "extension would have a minimal impact on Metrorail ridership and volumes on study area roadways inside the Beltway and would therefore not relieve congestion in the study corridor." The most prominent expansion is the Dulles Corridor Metrorail Project, dubbed the Silver Line, a 23-mile (37 km) extension from the Orange Line into Loudoun County, Virginia, by way of Tysons Corner and Washington Dulles International Airport. Rail to Dulles has been discussed since the system opened in 1976. The current Silver Line project was formally proposed in 2002 and initially approved by the Federal Transit Administration in 2004. After several delays, federal funding for Phase 1 was secured in December 2008 and construction began in March 2009. The line will be constructed in two phases; the first phase to Wiehle – Reston East in Reston, Virginia opened July 26, 2014, and the second phase to Virginia Route 772, beyond Dulles Airport, is projected for completion in 2019 or 2020. New Tysons Corner Metro Station under construction next to Virginia State Route 123. On July 6, 2012, around 4:45 pm, a Green Line train bound for downtown Washington, DC and Branch Avenue derailed near West Hyattsville. No injuries were reported. A heat kink, due to the hot weather, was identified as the probable cause of the accident. 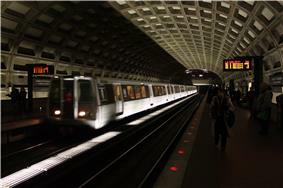 On April 24, 2012, around 7:15 pm, a Blue Line train bound for Franconia–Springfield derailed near Rosslyn. No injuries were reported. The Mount Vernon Square accident was one of a series of five derailments involving 5000-Series cars, with four of those occurring on side tracks and not involving passengers. 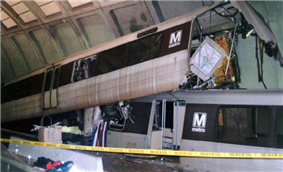 On January 7, 2007, a Green Line train carrying approximately 120 people derailed near the Mount Vernon Square station in downtown Washington. Trains were single-tracking at the time, and the derailment of the fifth car occurred where the train was switching from the south to northbound track. The accident injured at least 18 people and prompted the rescue of 60 people from a tunnel. At least one person had a serious but non-life-threatening injury. On January 20, 2003, during construction of a new canopy at the National Airport station, Metro began running trains through the center track even though it had not been constructed for standard operations, and a Blue Line train derailed at the switch. No injuries resulted, but the accident delayed construction by a number of weeks. On January 13, 1982, a train derailed at a malfunctioning crossover switch south of the Federal Triangle station. In attempting to restore the train to the rails, supervisors failed to notice that another car had also derailed. The other rail car slid off the track and hit a tunnel support, killing three people and injuring 25. Coincidentally, this accident occurred about 30 minutes after Air Florida Flight 90 crashed into the nearby 14th Street Bridge during a major snowstorm. 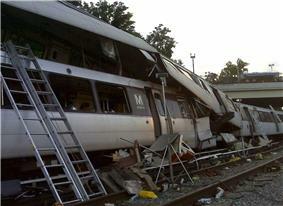 On November 29, 2009, at 4:27 am, two trains collided at the West Falls Church train yard. One train pulled in and collided into the back of the other train. No customers were aboard, and only minor injuries to the operators and cleaning staff were reported. However, three cars (1106, 1171, and 3216) were believed to be damaged beyond repair. 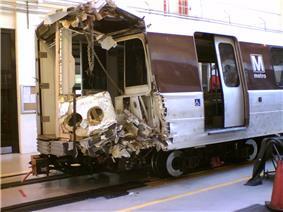 On June 22, 2009 at 5:02 pm, two trains on the Red Line collided. A southbound train heading toward Shady Grove stopped on the track short of the Fort Totten station, and another southbound train collided with its rear. The front car of the moving train (1079) was telescoped by the rear car of the standing train (5066), and passengers were trapped. Nine people died and more than 70 were injured, dozens of whom were described as "walking wounded". Red Line service was suspended between the Fort Totten and Takoma stations, and New Hampshire Avenue was closed. One of the dead was the operator of the train that collided with the stopped train. June 22, 2009 accident, in which nine people were killed. Several collisions have occurred on Washington Metro, resulting in injuries and fatalities, along with numerous derailments with few or no injuries. WMATA has been criticized for disregarding safety warnings and advice from experts. The Tri-State Oversight Committee oversees WMATA, but has no regulatory authority. Metro's safety department is usually in charge of investigating incidents, but cannot require other Metro departments to implement its recommendations. In 2010 Metro once again announced that it would implement random bag searches, and conducted the first such searches on December 21, 2010. The searches consist of swabbing bags and packages for explosive residue, and X-raying or opening any packages which turned up positive. On the first day of searches, at least one false positive for explosives was produced, which Metro officials indicated could occur for a variety of reasons including if a passenger had recently been in contact with firearms or been to a firing range. The DC Bill of Rights Coalition and the Montgomery County Civil Rights Coalition circulated a petition against random bag searches, taking the position that the practice violates the Fourth Amendment to the United States Constitution and would not improve security. On January 3, 2011 Metro held a public forum for the searches at a Metro Riders' Advisory Council meeting, at which more than 50 riders spoke out, most of them in opposition to the searches. However at the meeting Metro officials called random bag inspections a "success" and claimed that few riders had complained. The Metro Riders' Advisory Council recommended to WMATA’s board of directors that Metro hold at least one public meeting regarding the search program. As of December 2008, Metro had not conducted a single bag search. On October 27, 2008, the Metro Transit Police Department announced plans to immediately begin random searches of backpacks, purses, and other bags. Transit police would search riders at random before boarding a bus or entering a station. It also explained its intent to stop anyone acting suspiciously. Metro claims that the United States Court of Appeals for the Second Circuit decision in MacWade v. Kelly, which upheld random searches on the New York City Subway, allows Metro Transit Police to take similar action. Metro Transit Police Chief Michael Taborn stated that, if someone were to turn around and simply enter the system through another escalator or elevator, Metro has "a plan to address suspicious behavior". Security expert Bruce Schneier characterized the plan as "security theater against a movie plot threat" and does not believe random bag searches actually improve security. Metro's zero-tolerance policy on food, trash and other sources of disorder embodies the "broken windows" philosophy of crime reduction. This philosophy also extends to the use of station restroom facilities. A longstanding policy, intended to curb unlawful and unwanted activity, has been to only allow employees to use Metro restrooms. Station managers may make exceptions for passengers with small children, the elderly, or the disabled. Metro now allows the use of restrooms by passengers who gain a station manager's permission, except during periods of heightened terror alerts. Each city and county in the Metro service area has similar ordinances that regulate or prohibit vending on Metro-owned property, and which prohibit riders from eating, drinking, or smoking in Metro trains, buses, and stations; the Transit Police have a reputation for enforcing these laws rigorously. One widely publicized incident occurred in October 2000 when police arrested 12-year-old Ansche Hedgepeth for eating french fries in the Tenleytown-AU station. In a 2004 opinion by John Roberts, now Chief Justice of the United States, the D.C. Circuit Court of Appeals upheld Hedgepeth's arrest. By then WMATA had answered negative publicity by adopting a policy of first issuing warnings to juveniles, and arresting them only after three violations within a year. Metro is patrolled by its own police force, which is charged with ensuring the safety of passengers and employees. Transit Police officers patrol the Metro system and Metrobuses, and they have jurisdiction and arrest powers throughout the 1,500-square-mile (3,900 km2) Metro service area for crimes that occur on or against transit authority facilities, or within 150 feet (46 m) of a Metrobus stop. The Metro Transit Police Department is one of two U.S. police agencies that has local police authority in three "state"-level jurisdictions (Maryland, Virginia, and the District of Columbia), the U.S. Park Police being the other. Metro planners designed the system with passenger safety and order maintenance as primary considerations. The open vaulted ceiling design of stations and the limited obstructions on platforms allow few opportunities to conceal criminal activity. Station platforms are built away from station walls to limit vandalism and provide for diffused lighting of the station from recessed lights. Metro's attempts to reduce crime, combined with how the station environments were designed with crime prevention in mind, has contributed to Metro being among the safest and cleanest subway systems in the United States. There are nearly 6,000 video surveillance cameras used across the system to enhance security. The contract for Metro's fare collection system was awarded in 1975 to Cubic Transportation Systems. The current electronic fare collection started on July 1, 1977, a little more than a year after the first stations opened. Prior to electronic fare collection, exact change fareboxes were used. Metro's paper farecard system is also shared by Bay Area Rapid Transit, which Cubic won a contract for in 1974. 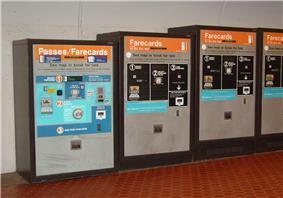 In May 2014 Metro announced plans to retrofit more than 500 fare vending machines throughout the system to dispense SmarTrip cards, rather than paper fare cards, and eventually eliminate magnetic fare cards entirely. Users can add value to any farecard, but riders must pay an exit fare if the cost of a trip is higher than their card’s balance. Riders may transfer for free, provided they do not exit through the faregates. SmarTrip users receive a $0.50 discount on bus-to-rail and rail-to-bus transfers. On October 28, 2011 Metro launched Farragut Crossing, a “virtual tunnel” between Farragut West and Farragut North stations that allows SmarTrip customers to transfer above ground for free, provided that they do so within 30 minutes. A One Day Pass for $14.50, valid for one day of unlimited Metrorail travel. The pass expires at the end of the operating day. 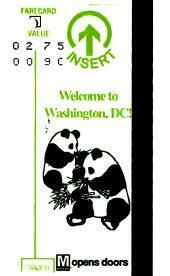 Since July 1, 2012, this pass has been available on SmarTrip as well as a paper pass. Prior to that time the cost of the pass was much less ($9 vs. $14), but it was not valid for the morning peak period on weekdays. Since June 1, 2013, this has been the only pass available on a paper card. A 7-Day Short Trip Pass for $36, valid for seven consecutive days for Metrorail trips costing up to $3.60 (the maximum off-peak fare) during peak fare times and any trip during off-peak hours. (The $1 paper farecard surcharge is not applicable.) If the trip costs more than $3.60 the difference had to be paid at the Exitfare machine (for paper passes) before leaving, or is deducted from the cash balance of a SmarTrip card. A positive stored value is required to enter the Metrorail system. It became available on SmarTrip on May 20, 2013, and has not been sold as a paper pass after May 31, 2013. A 7-Day Fast Pass for $59.25, valid for seven consecutive days of unlimited Metrorail travel. Since April 16, 2012, users have been able to purchase the Fast Pass on a SmarTrip card. The 7-Day Fast Pass has not been sold as a paper pass since September 1, 2012, and has not been accepted on a paper pass after December 31, 2012. Since July 1, 2012, a 28-Day Metrorail Fast Pass available on SmarTrip only for $237. Like the version of this pass offered years ago on a thin plastic mag-stripe farecard, this is for convenience only, offering no savings over four uses of the 7-Day Fast Pass. Metro fares vary based on the distance traveled and the time of day at entry. During peak hours (weekdays from opening until 9:30 a.m. and 3–7 p.m., and Friday and Saturday nights from midnight to closing), fares (effective 2014) range from $2.15 to $5.90, depending on distance traveled. At all other times, fares range from $1.75 to $3.60 based on distance traveled. Customers using a paper farecard must add an additional $1.00 fee for each ride. Discounted fares are available for school children, the disabled, and the elderly. Metro charges reduced fares on all federal holidays. Riders enter and exit the system using a stored-value card in the form of a paper magnetic stripe farecard or a proximity card known as SmarTrip. The fare is deducted from the balance of the card; on paper farecards, the new balance is printed upon exiting the system. Farecards are purchased primarily at vending machines in each station. Paper farecards can hold up to $45 in value and are reused until the value of the card reaches zero. If the card contains the exact fare needed to exit, leaving the card at a zero balance, the card is not returned by the exit gate. SmarTrip cards can be purchased at station vending machines, online or at retail outlets, and can store up to $300 in value. The rechargeable SmarTrip card itself costs $2.00. A Passenger Information Display System (PIDS) was installed in all Metrorail stations in 2000. Displays are located on all track platforms and at the mezzanine entrances of stations, and provide real-time information on next train arrivals, delayed trains, emergency announcements, and related information. WMATA also provides current train and related information to customers with conventional web browsers, as well as users of smartphones and other mobile devices. In 2010 Metro began sharing its PIDS data with outside software developers, for use in creating additional real-time applications for mobile devices. Free apps are available to the public on major mobile device software platforms (iPhone/iPad, Android, Windows Phone, Palm). WMATA also began providing real-time train information by phone in 2010. The Rush+ realignment was intended to free up space in the Rosslyn Portal (the tunnel between Rosslyn and Foggy Bottom), which operates at full capacity already. When Silver Line service began, those trains would be routed through the tunnel, and so some of what were Blue Line trains to Largo Town Center were now diverted across the Fenwick Bridge to become Yellow Line trains running all the way up the Green Line to Greenbelt. Select Yellow Line trains running south diverted along the Blue Line to Franconia-Springfield (as opposed to the normal Yellow line terminus at Huntington). Until the start of Silver Line service, excess Rosslyn Tunnel capacity was used by additional Orange Line trains that traveled along the Blue Line to Largo (as opposed to the normal Orange Line terminus at New Carrollton). Rush+ had the additional effect of giving some further number of passengers transfer-free journeys, though severely increasing headways for the portion of the Blue Line running between Pentagon and Rosslyn. In 2012, WMATA announced enhanced rush period service that was implemented on June 18, 2012 under the name Rush+ (or Rush Plus). Rush Plus service occurs only during portions of peak service: 6:30-9 AM and 3:30-6 PM, Monday through Friday. Until 1999, Metro ended service at midnight every night, and weekend service began at 8 am. That year, WMATA began late night service on Fridays and Saturdays until 1 am. By 2007, with encouragement from businesses, that closing time had been pushed back to 3 am. There were plans floated to end late night service due to costs in 2011, but they were met with resistance by riders. Other service truncations also occur in the system during rush hour service only. On the Red Line, every other train bound for Shady Grove terminates at Grosvenor-Strathmore, in addition to the alternating terminations at Silver Spring mentioned above. For the Yellow Line, all non-Rush+ trains (that is, all trains originating from Huntington, not Franconia-Springfield) bound for Fort Totten terminate at Mount Vernon Square. These are primarily instituted due to a limited supply of rail cars and the locations of pocket tracks throughout the system. Metrorail begins service at 5 am Monday through Friday and at 7 am Saturdays and Sundays; it ends service at midnight Sunday through Thursday nights and at 3 am on Friday and Saturday nights, although the last trains leave the end stations inbound about half an hour before these times. Trains run more frequently during rush hours on all lines, with scheduled peak hour headways of 3 minutes on the Red Line and 6 minutes on all other lines. Headways are much longer during midday and evening on weekdays and all weekend. The midday six-minute headways are based on a combination of two Metrorail lines (Orange/Blue and Yellow/Green) as each route can run every 12 minutes; in the case of the Red Line, every other train bound for Glenmont terminates at Silver Spring instead. Night and weekend service varies between 8 and 24 minutes, with trains generally scheduled only every 20 minutes. As of 2012, the WMATA board of directors was considering adopting a new policy that would codify maximum acceptable headways as 15 minutes during peak hours and 30 minutes during off-peak. The train doors were originally designed to be opened and closed automatically and the doors would re-open if an object blocked them, much as elevator doors do. Almost immediately after the system opened in 1976 Metro realized these features were not conducive to safe or efficient operation and they were disabled. At present the doors may be opened automatically or manually. If a door tries to close and it meets an obstruction, the operator must re-open the door. Since June 2009, when two Red Line trains collided and killed nine people due in part to malfunctions in the ATC system, all Metro trains have been manually operated. The current state of manual operation has led to heavily degraded service, with new manual requirements such as absolute blocks, speed restrictions, and end-of-platform stopping leading to increased headways between trains, increased dwell time, and worse on-time performance. Metro will begin phasing back in ATC in October 2014. In May, 2015, WMATA's plan to replace 192 of the chronically problematic 5000-series cars built in the early 2000s with 220 new 7000-series cars was at risk because the older cars were funded by federal money and requires FTA approval. 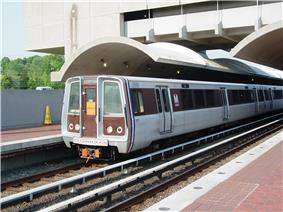 As a result, on July 26, 2010, Metro voted to purchase 300 7000 series cars to replace the remaining 1000 series cars. An additional 128 7000 series cars were also ordered to serve the new Silver Line to Dulles Airport (64 for each phase). In May 2013, Metro placed another order for 100 7000 series cars, which will replace all of the 4000 series cars. By June 2015 WMATA plans to exercise their remaining options to purchase an additional 220 7000 series railcars for fleet expansion, bringing the total number of 7000 series railcars on order to 748. The 7000 series of cars, currently being built by Kawasaki Heavy Industries Rolling Stock Company of Kobe, Japan are being delivered for on-site testing during winter 2013, and first entered service April 14, 2015 on the Blue Line. The new cars are different from previous models in that while still operating as married pairs, the cab in one car can be removed, essentially turning it into a B car. The new design allows for increased passenger capacity, elimination of redundant equipment, greater energy efficiency, and lower maintenance costs. Metro plans to eventually purchase up to 748 cars to increase system capacity and replace its older rolling stock. The National Transportation Safety Board investigation of the fatal June 22, 2009, accident led it to conclude that the 1000 series cars are unsafe and unable to protect customers in a crash. Metro's rolling stock was acquired in six phases, and each version of car is identified with a separate series number. The original order of 300 rail cars (290 of which are in operation as of June 2009) was manufactured by Rohr Industries, with final delivery in 1978. These cars are numbered 1000–1299 and were rehabilitated in the mid-1990s. Breda Costruzioni Ferroviarie (Breda), now AnsaldoBreda, manufactured the second order of 76 cars delivered in 1983 and 1984. These cars, numbered 2000–2075, were rehabilitated in the early 2000s by Alstom in Hornell, New York. A third order of 288 cars, also from Breda, were delivered between 1984 and 1988. These cars are numbered 3000–3291 and were rehabilitated by Alstom in the early 2000s. An order of 100 cars from Breda, numbered 4000–4099, were delivered between 1992 and 1994. A fifth order of 192 cars was manufactured by Construcciones y Auxiliar de Ferrocarriles (CAF) of Spain. 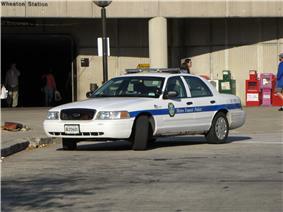 These cars are numbered 5000–5191 and were delivered from 2001 through 2004. A sixth order of 184 cars from Alstom Transportation, are numbered 6000-6183 and were delivered between 2005 and 2007. The cars have body shells built in Barcelona, Spain with assembly completed in Hornell, New York. Metro’s fleet consists of 1,126 rail cars, each 75 feet (22.86 m) long. Trains have a maximum speed of 75 mph (121 km/h), and average 33 mph (53 km/h) including stops. Operating rules presently limit their top speed to 59 mph (95 km/h). All cars operate as married pairs (consecutively numbered even-odd), with systems shared across the pair. Metro currently operates 850 cars during rush hours. 814 cars are in active service, four cars have been permanently removed from revenue service for use as the "money train", and the remaining 36 cars compose gap trains to serve as backup should a train experience problems. The system is not centered on any single station, but Metro Center is at the intersection of the Red, Orange and Blue Lines, the three busiest lines, as well as the new Silver Line. The station is also the location of WMATA's main sales office. Metro has designated five other "core stations" that have high passenger volume, including: Gallery Place, transfer station for the Red, Green and Yellow Lines; L'Enfant Plaza, transfer station for the Orange, Blue, Silver, Green and Yellow Lines; Union Station, the busiest station by passenger boardings; Farragut North; and Farragut West. At 196 feet (60 m) below the surface, the Forest Glen station on the Red Line is the deepest in the system. There are no escalators; high-speed elevators take 20 seconds to travel from the street to the station platform. The Wheaton station, next to Forest Glen station on the Red Line, has the longest continuous escalator in the USA and in the Western Hemisphere, at 230 feet (70 m). The Rosslyn station is the deepest station on the Orange/Blue Line, at 117 feet (36 m) below street level. The station features the second-longest continuous escalator in the Metro system at 194 feet (59 m); an escalator ride between the street level and the mezzanine level takes nearly two minutes. There are 40 stations in the District of Columbia, 15 in Prince George's County, 11 in Montgomery County, 11 in Arlington County, 11 in Fairfax County, and three in the City of Alexandria. The second phase of the Silver Line will add 6 new stations, three more in Fairfax County and three in Loudoun County, Virginia in 2019 or 2020. About 50 miles (80 km) of Metro's track is underground, as are 47 of the 91 stations. Track runs underground mostly within the District and high-density suburbs. Surface track accounts for about 46 miles (74 km) of the total, and aerial track makes up 9 miles (14 km). 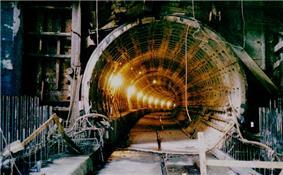 Since opening in 1976, the Metro network has grown to include six lines, 91 stations, and 118 miles (190 km) of route. The rail network is designed according to a spoke-hub distribution paradigm, with rail lines running between downtown Washington and its nearby suburbs. The system makes extensive use of interlining – running more than one service on the same track. There are six operating lines. The system's iconic official map was designed by noted graphic designer Lance Wyman and Bill Cannan while they were partners in the design firm of Wyman & Cannan in New York City. In January 2014, the AIA announced that it would present its Twenty-five Year Award to the Washington Metro system for "an architectural design of enduring significance" that "has stood the test of time by embodying architectural excellence for 25 to 35 years". The announcement cited the key role of Weese, who conceived and implemented a "common design kit-of-parts", which continues to guide the construction of new Metro stations over a quarter-century later, albeit with designs modified slightly for cost reasons. In 2007, the design of the Metro's vaulted-ceiling stations was voted number 106 on the "America's Favorite Architecture" list compiled by the American Institute of Architects (AIA), and was the only brutalist design to win a place among the 150 selected by this public survey. Many Metro stations were designed by Chicago architect Harry Weese and are examples of late-20th century modern architecture. With their heavy use of exposed concrete and repetitive design motifs, Metro stations display aspects of brutalist design. The stations also reflect the influence of Washington's neoclassical architecture in their overarching coffered ceiling vaults. Weese worked with Cambridge, Massachusetts-based lighting designer Bill Lam for the indirect lighting used throughout the system. All of Metro's original Brutalist stations are found in Downtown Washington, D.C. and neighboring urban corridors of Arlington, Virginia, with newer stations incorporating simplified cost-efficient designs. On October 30, 2010, the crowd at the Rally to Restore Sanity and/or Fear broke a 19-year record in Saturday ridership, with 825,437 trips. The previous record had been set on June 8, 1991 at 786,358 trips during the Desert Storm rally. In February 2006, Metro officials chose Randi Miller, a car dealership employee from Woodbridge, Virginia, to record new "doors opening", "doors closing", and "please stand clear of the doors, thank you" announcements after winning an open contest to replace the messages recorded by Sandy Carroll in 1996. The "Doors Closing" contest attracted 1,259 contestants from across the country. The highest ridership for a single day was on the day of the inauguration of Barack Obama, January 20, 2009, with 1,120,000 riders. It broke the previous record, set the day before, of 866,681 riders. June 2008 set several ridership records: it set the single-month ridership record of 19,729,641 total riders, the record for highest average weekday ridership with 1,044,400 weekday trips, had five of the ten highest ridership days, and had 12 weekdays in which ridership exceed 800,000 trips. Metro construction required billions of federal dollars, originally provided by Congress under the authority of the National Capital Transportation Act of 1969 (Public Law 91-143). The cost was paid with 67% federal money and 33% local money. This act was amended on January 3, 1980 by Public Law 96-184, "The National Capital Transportation Amendment of 1979" (also known as the Stark-Harris Act), which authorized additional funding of $1.7 billion to permit the completion of 89.5 miles (144.0 km) of the system as provided under the terms of a full funding grant agreement executed with WMATA in July 1986, which required 20% to be paid from local funds. On November 15, 1990, Public Law 101-551, "The National Capital Transportation Amendments of 1990", authorized an additional $1.3 billion in federal funds for construction of the remaining 13.5 miles (21.7 km) of the 103-mile (166 km) system, completed via the execution of full funding grant agreements, with a 63% federal/37% local matching. The 103-mile (166 km), 83-station system was completed with the opening of the Green Line segment to Branch Avenue on January 13, 2001. This did not mean the end of the growth of the system: a 3.22-mile (5.18 km) extension of the Blue Line to in-fill station, NoMa – Gallaudet University (at the time called the New York Ave–Florida Ave–Gallaudet University station) on the Red Line between Union Station and Rhode Island Ave-Brentwood, opened November 20, 2004. Construction began in March 2009 for an extension to Dulles Airport to be built in two phases and opening in 2014 and 2018. The first phase, five stations connecting East Falls Church to Tysons Corner and Wiehle Avenue in Reston, opened on July 26, 2014. .New York City Subway, who designed the subway maps for the Massimo Vignelli The name Metro was suggested by  Underground stations were built with cathedral-like arches of concrete, highlighted by soft, indirect lighting. and Fairfax County, Virginia, and Alexandria, Virginia, on December 17, 1983.